I am a gal who took the blind leap of faith to follow a dream created in the suburb of residential Connecticut to move and create a farm in Virginia. My husband and I with our three teenagers plunged ahead to move from the most perfect, 1/3 of an acre colonial home in the seaside town of Madison CT. We left loyal friends and a relatively cushy lifestyle. We longed to leave a state where we would never have the open lifestyle of tailgating, polo, hunting, vineyards and BBQ. Garden and Gun and Southern Living magazines were annual renewals! Three years in to the dream the stars aligned. The recession began to lift, Chuck got the OK to work closer to DC, and we found our new home. We moved to 10 acres of pasture land set amongst 200 on the piedmont of the Blue Ridge mountains. On a side note, because I am a metaphysical kind a girl. I should say that this vision and lifestyle was the result of a dream board created one New Year’s Day, which was now 5 years ago. Chuck and I ripped out pictures from a stack of saved magazines and created in pictures the life we now live. On our dream board hens strutted amongst the other dream things. Downy hens wearing fluffy pantaloons soon ran the grassy acres of Tranquil Farm. 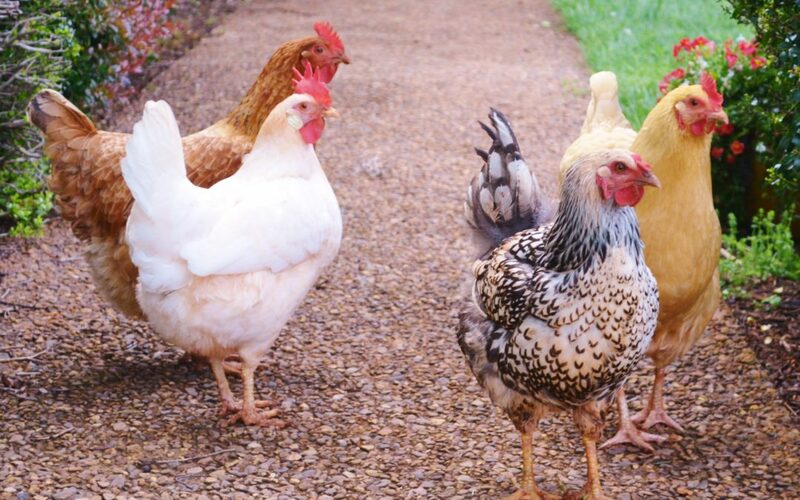 Hens depict the epitome of farm life and provide wholesome food of the freshest kind; eggs. These are “The Girls” affectionately called and lovingly cared for. We always built our chicken coops and runs, though here is VA we also surround the coop with an electric fence. We have a solar electric battery charger which protects them throughout the night. Living on a small farm, there is a quick learning curve about the need for home land security. Packs of 15 or more coyotes serenade our property on summer nights because we are close to a pond. So, extra protection is not optional. Living in the country is filled with faith that all will be as it will, despite all our effort. I spent the first year and a half filled with anxiety until I finally realized I simply must do my absolute best to protect them. Despite putting them in each night, letting them out each AM, watering, feeding, offering them scraps, egg laying boxes, de-worming, extra bedding, and the still evenings chatting with them as they let go the heat of the day, things can go terribly wrong. For instance, the neighbor’s dog…need I go further? Thank goodness that incident yielded in only one leaving us. Try as I may, things do go south too fast and learning to get go is necessary. Despite the occasional death of one of our Girls, watching them live amongst us is a pure Joy that affirms the decision to get out of our comfort zone and try on a new life. We are so happy that we did. If you would like to share a thought…please do! Being from a rural area I never got to experience the pleasures and simple joys of living on a farm with animals but when I met my husband he introduced me to his family farm and the experience is like no other. The mini panic attacks from the hens and roosters and emus chasing us or pecking at us sure make for some lasting memories! Welcome to VA. We are from NY and moved here almost 30 years ago. We live in No. Va and love the ride to Charlottesville. What a lovely place you have picked to settle in. I wish you much happiness in your new home .